« Do you Discover & Go? A not-to-be-missed event! 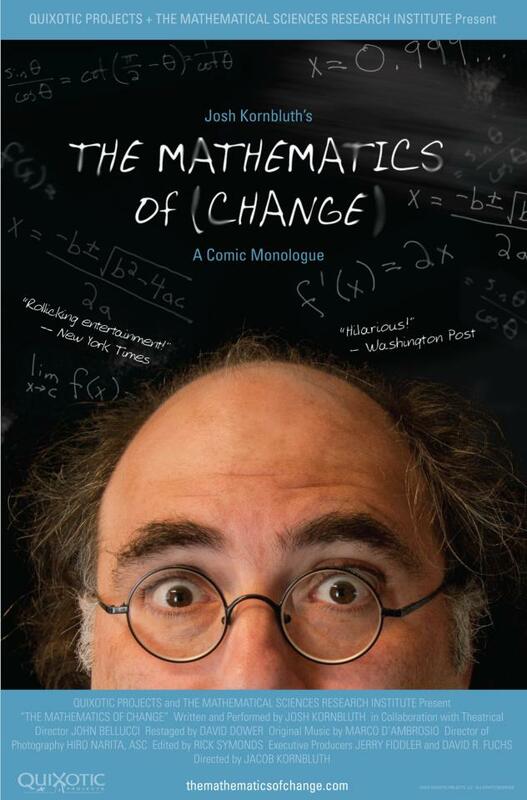 Acclaimed monologuist Josh Kornbluth joins us in person for this World Premiere screening of the film version of his off-Broadway hit “The Mathematics of Change.” A Q&A with Josh follows the film. Kornbluth has toured the U.S. extensively with this Off-Broadway hit, thrilling audiences of math-lovers and math-fearers alike. This concert film captures Josh performing the show in a unique setting: the world-renowned Mathematical Sciences Research Institute in Berkeley. You’ll laugh, you’ll cry, you’ll imagine yourself to be covered in chalk dust — and you’ll never look at the number 3 the same way again! For more information about the film visit joshkornbluth.com. A co-presentation of Albany FilmFest, the Albany Library, and Friends of the Albany Library. The community center is wheelchair-accessible. The Library will provide an ASL interpreter for this event with at least 7 working days’ notice. Call 510-526-3720 or TTY 888-663-0660.